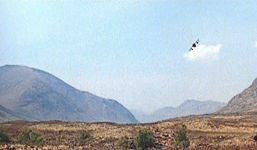 At the end of the movie a Jaguar aircraft is seen flying over the car containing Connor and Brenda. 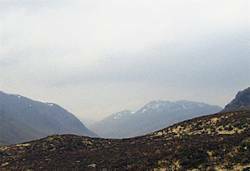 This was filmed on the road coming up from Glen Etive to Glen Coe next to Buchaille Etive Mor. Glen Coe is used by the Royal Air Force for low level flying training so it is not uncommon to have a fighter and/or transport aircraft flying overhead (or underneath if you are up one of the hills in the glen).